Open Studio night returns to Water Bar! Get out of the house - make things with other people - and get to know local artists and other neighbors. Bring your own materials and works-in-progress, or use what we've got on hand. Find a quiet corner, or join a table and make new friends. 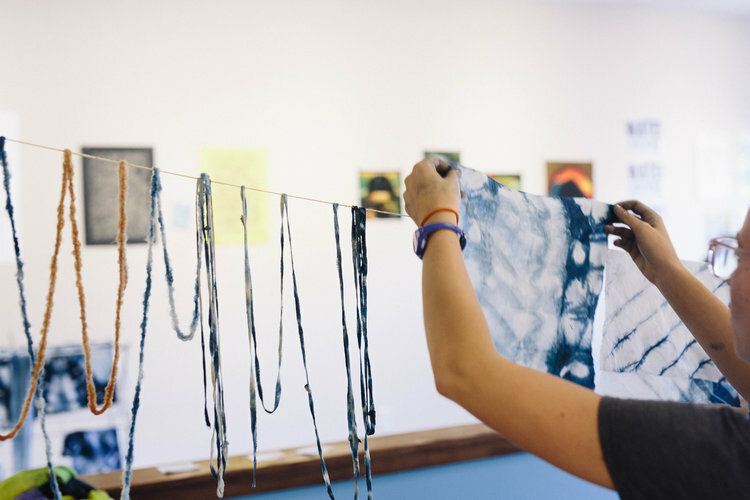 We'll be joined by artist Sarah Nassif, who will be prepping an indigo dye bath and dyeing fibers for an upcoming Weaving Water workshop she's leading the Great River Coalition. Bring your questions about working with water and natural fibers and dyes! Water Bar artist Shanai Matteson will also prepare a dye bath made from "overburden" gathered on Minnesota's Iron Range. Overburden is a term used to describe "waste earth" that has been removed in the process of mining. The iron content in this soil makes a natural dye that Matteson and her collaborators are using in a community felting and quilting project this summer. Open Studio visitors are welcomed to bring their own fibers (natural materials like cotton, wool, or hemp work best) to try dyeing these in either the indigo or overburden baths - while also learning about the role of water in both these artistic practices, and the communities where they are rooted.